We know four trainers started in Pallet town. Three with one of the three original starters and Ash with his Pikachu. Apart from Gary, were the other two trainers ever revealed in the anime? And was it ever revealed who got which specific starter Pokemon? First, the things we know: Ash got late and had to pick the reserve Pokemon Pikachu. The other 3 starter Pokemon already got picked, one of which was picked by Gary. At the end of the series, you could see that Gary picked Squirtle. So the question is, who picked the other 2 starters and where were they mentioned? Your question really inspired me to find a answer. I found answers on multiple sites. In the series, Ash and co. encounter a Charmander that was abandoned by its owner. We might infer that the original owner was one of the other two Pallet Town trainers. In addition, the Bulbasaur Ash and co. encounter was raised in the Hidden Village, which the article linked states was a haven for, among other things, abandoned Pokemon. So it appears possible that the other Pallet Town trainers also abandoned his starter Pokemon. These two mystery trainers' sole purpose in the anime was to be a plot device so that Ash would miss out on all 3 standard starter Pokemon and get Pikachu. So they invented 2 other trainers to get the remaining Pokemon... and they were referenced a few times until after Ash got the Earth badge and returned to Pallet town. That was when Oak said that the "other two" gave up and flunked out. Thus writing them out of the show permanently... never to be referenced again. I think the 2 trainers weren't meant to have a big part in this series. They were just needed to give Ash the rare Pokemon everyone wants to have. Pokémon: Indigo League, episode 10 "Bulbasaur And The Hidden Village": Bulbasaur protects a "spa resort for pokémon" village in which the only human there, a girl by the name of Melanie, takes care of them. By theory, we conclude that Melanie does not want to be a trainer but more of a caretaker for pokémon and may have "abandoned" or set free Bulbasaur to choose his own path. 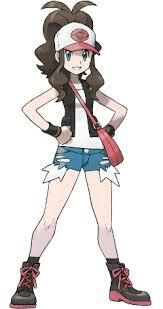 But there is speculation that she might be too old to have recently left Pallet town considering she is as tall as Brock. He falls for her and is older than Ash and Misty. 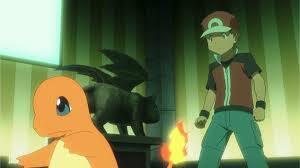 Pokémon: Indigo League, episode 11 "The Stray": Charmander is left on a rock and his trainer said he'd be back for him. His original owner's name is Damian. Oddly enough he brags about how many pokémon he has on a table in pokéballs - over the 6 pokéball legal limit. By theory, he is one of the new pokémon trainers from Pallet town and chose the Charmander as his first. Starter pokémon are associated with "beginner" which in turn translates to some as "weak". A pokémon you catch and earned is less likely to be discarded because of work you put into it unlike the freely given pokémon at the start. This may be what Damian was thinking of Charmander at the time. Pokémon: Johto League, episode 269 (or S3E152) "The Ties That Bind": Professor Oak bragged to Ash that Gary had chosen the best starter pokémon in the first episode without revealing which one this might have been. 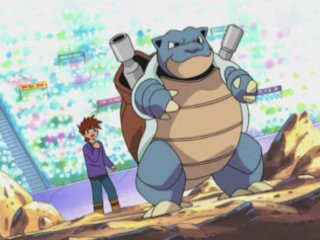 Gary Oak reveals his third pokémon in a match against Ash to be the evolved form of his starter pokémon, Blastoise (originally Squirtle). Gary Oak was the only other trainer apart from Ash from Pallet town that was carried on through the anime series to be his rival. The other two were simply written off by Professor Oak (ep64) who stated that the other two flunked out of Pokémon Training. I think Damian, the original owner of Ash's Charmander (now Charizard), was one of the Pokemon trainers from Pallet Town. Firstly, because he wasn't seen at the Pokemon League. Secondly, wild Charmanders weren't seen in the anime much or maybe at all. So it's reasonable to say that he got it as his starter. I don't know about Bulbasaur, though. It probably belonged to a girl who quit in episode 30 something, because she wanted her Pokemon to just be her companions. I agree with the Damian being another Pallet trainer. As for the other, it could be that girl in the original theme song that never appears in the anime and she could have had the abandoned Bulbasaur which Ash found. I can't take credit for this answer as I got it from a YouTube video by ProtoMario. Professor Oak or any other professor gives trainer a Pokemon with five Poke Balls and a Pokedex. In "Mystery at the Lighthouse", Misty says a trainer can have a maximum of six Pokemon and the others are automatically transported to the place where they got their Pokedex. Now Damien had over 6 Poke Balls and he said all Poke Balls contained Pokemon. So if he had been a trainer who got a starter Pokemon, he would have a Pokedex which would have directly transported all other Pokemon to Oak. It makes no sense, but in episode 4 "The Challenge of Samurai", he says that all three trainers have passed and he lost to all three. At Cerulean Gym, one of Misty's sisters says that they lost to all trainers from Pallet. So it means they are on the same way. Now, Pewter Gym is before Cerulean Gym or Vermilion Gym. If all three were ahead of Ash from Samurai till Cerulean Gym, surely they passed Pewter before Ash. So Brock should have known them and Damien. But why did Brock act like it's Damien's first time he is meeting? I know the trainer who picked Charmander. He kinda looked like the same as Ash, but I think its Red. Just saying guys, Red looks like Ash, but I don't know the Bulbasaur one. I saw one of Red's series, his starter was a Charmander, so maybe its Red. Oh I also found who got Bulbasaur. Her name is Saur. What would be considered canon in the Pokemon franchise? Do HM's appear outside the games?